Names are so important, aren’t they? Kim and Kanye naming their daughter North West was particularly cringe-worthy. (And what happened? Weren’t they going with a K-name? In which case shouldn’t she be called Knorth West?) But to my point: names matter. They are windows into the soul of its subject. Take this recipe, for example. When I clipped it from a newspaper decades ago and typed it on an index card, it was called “Texas Hash.” I no longer remember if the recipe originated from the Lone Star State, but most of the hash recipes I’ve ever seen call for potatoes. There’s nary a spud here! The taste, however, is so reminiscent of my mother’s stuffed peppers (a recipe for which I’ve never found), that I have taken it upon myself to rename the dish. I call it “Unstuffed Peppers.” It’s quick and easy and delicious. Inexpensive, too. Can’t ask for much more in a casserole (or a kasserole), now can you? Heat oven to 350-degrees. 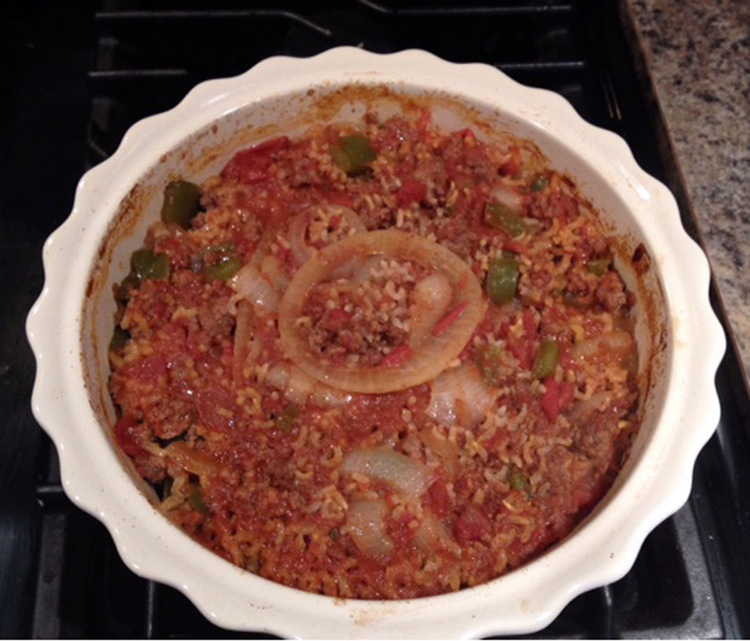 In a large skillet, cook and stir the ground beef until light brown. Drain off any fat. (If the beef is particularly lean, cook it in a tablespoon of canola oil.) Add onions and green pepper, cooking and stirring until onion is tender. Stir in the tomatoes (and the juice in the can), the rice, and the seasonings. Heat through. Pour into an ungreased two-quart casserole. Cover and bake for one hour. 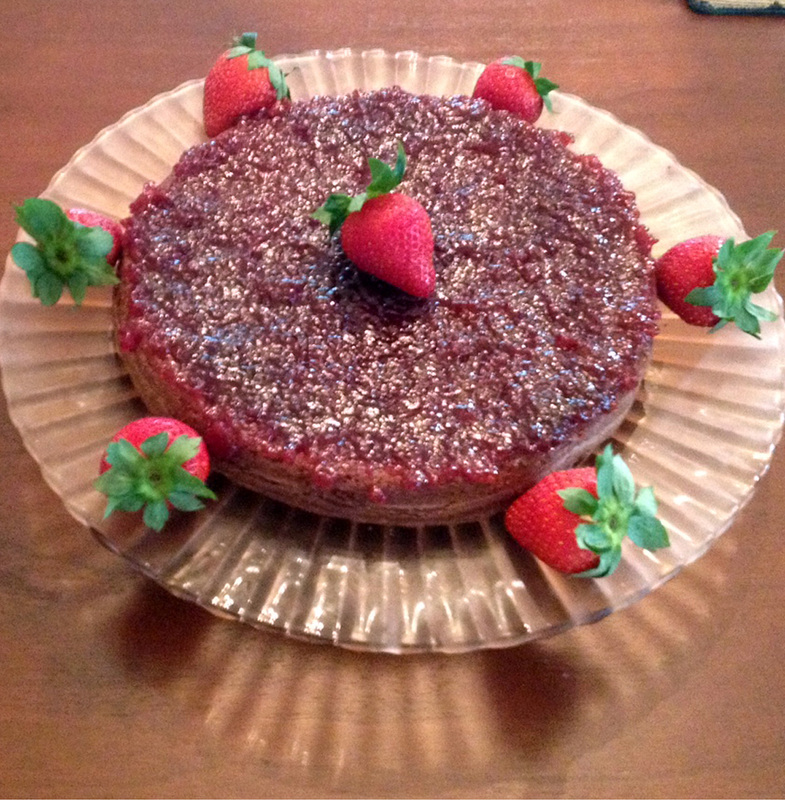 Oh, and by the way…bloggers from The Midlife Boulevard are sharing their favorite recipes. Click where it says “Click here” to find out what’s cooking! *Some people prefer anise flavoring, or even lemon. I’m not one of those people. 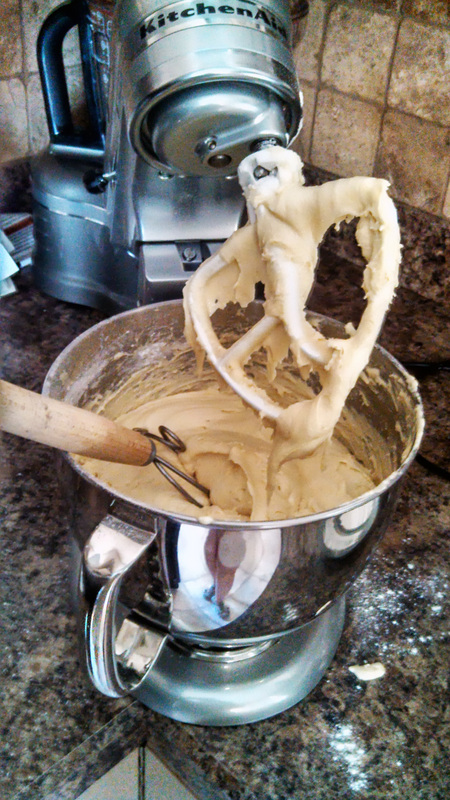 STEP ONE: Cream sugar and shortening in a stand mixer using the paddle attachment. Add eggs, one at a time, beating after each addition. 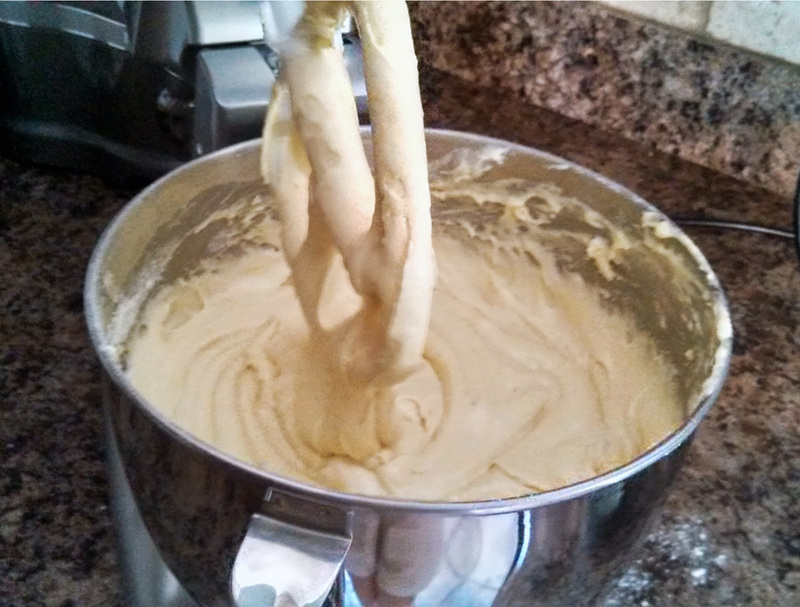 Here’s how the dough should look after all six eggs have been incorporated into the batter. STEP TWO: Combine vanilla and milk. Add baking powder to five cups of the flour. Add some of the vanilla/milk, and alternate with some of the enhanced flour. 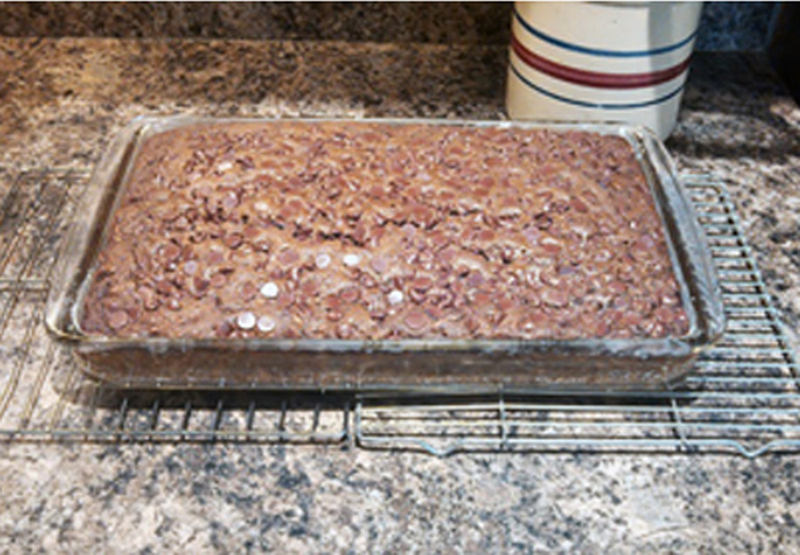 Beat after each addition and continue to alternate liquid with dry ingredients until the five cups of enhanced flour have been used up. Here’s how the dough should look after the vanilla/milk mixture and five cups of flour (with baking powder incorporated) have been added. STEP THREE: Add remaining three cups of flour a small amount at a time, beating after each addition and scraping down the sides of the bowl. At this point we begin to bake the way my grandmother did; she spoke very little English, and never wrote out her recipes—my mother was her scribe. You will absolutely have to add more flour—I can’t really say how much, because, like my grandmother, at this point I work by instinct. Just know that you’ll know you’ve hit the sweet spot when you pull apart a small amount of dough and it begins to hold shape and no longer feels sticky. You’ll also find, shortly before reaching this point, that the mixer has given you its all and it’s time to add the additional flour by hand, stirring well. At this stage you’ll want to use either a heavy spoon, or what I like to call a culinary carpet beater. If you’ve ever read my recipe for spätzle, you’ll recognize this utensil. Time to switch out the mixer and use some elbow grease, along with either a heavy spoon or a utensil like the one depicted here. I also find it helpful to transfer the dough into a larger bowl. STEP FOUR: You deserve a break after using the carpet beater. You’ll also have used your hands to knead the dough. 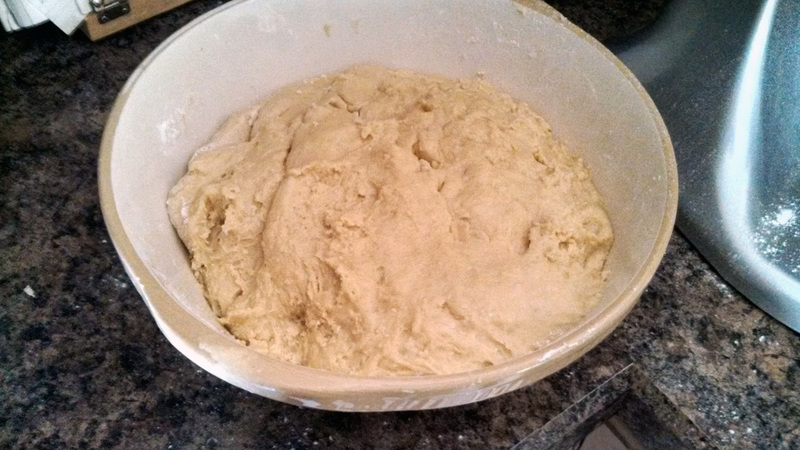 Note that I’ve transferred the dough to a larger bowl for easier handling. 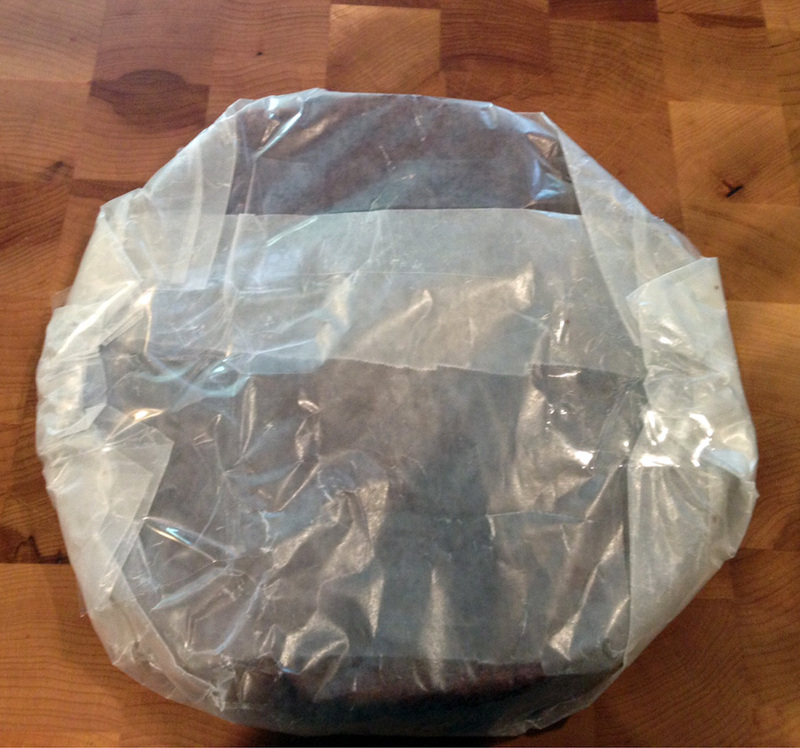 Top the dough closely with wax paper so that no air gets to it, Put plastic wrap over the entire bowl, and refrigerate it while you grab some lunch or a cup of coffee. Here’s what the finished dough should look like. It’s now ready for a brief sojourn in the refrigerator while you put your feet up. STEP FIVE: Remove the dough from the refrigerator and prepare your work area. 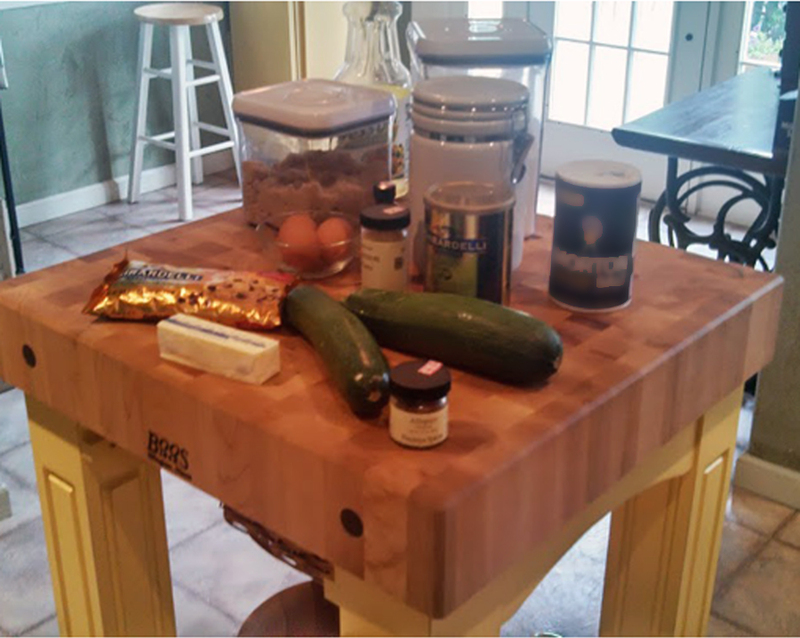 I like to use a large cutting board at my dining room table. (I’m careful to spread a heavy-duty vinyl table cloth on it first.) You’ll also need extra flour to dust the board, plenty of greased cookie sheets, and a knife for cutting the dough. Roll the dough, by hand, into desired shapes—I like to make braided wreaths, straight braids, S-shapes, and coils. This photo gallery will show you the process for making a braided wreath. Place the shaped biscotti on greased cookie sheets, and bake at 400-degrees for 10 to 12 minutes, or until they are very lightly browned on top. Do not overbake. Once they have cooled, they are ready for frosting. 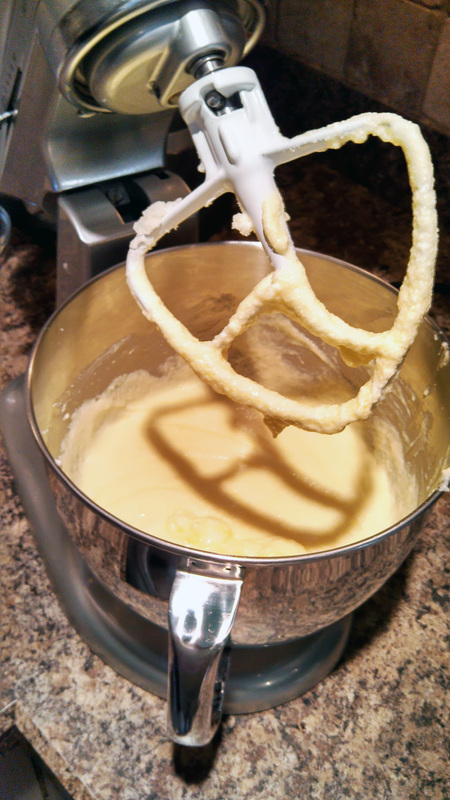 Using the whisk attachment of a stand mixer, cream butter with extract. 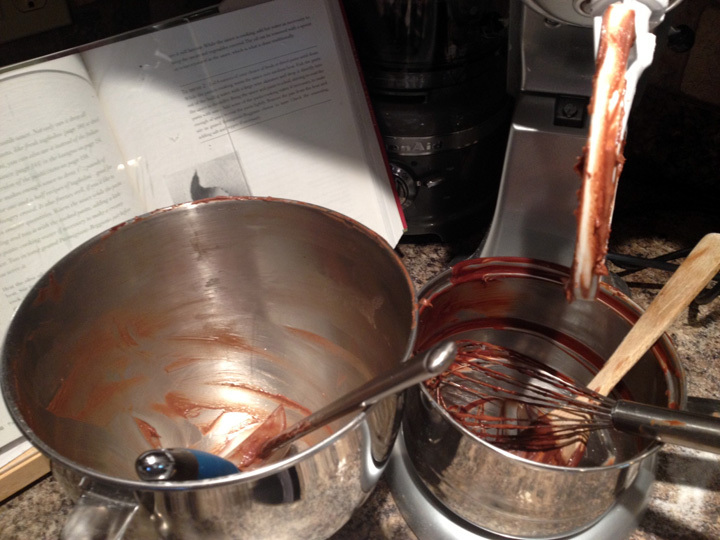 Gradually add Confectioner’s sugar, beating thoroughly after each addition. Stir in milk and beat until frosting is of spreading consistency. I find it helpful to prepare my workspace ahead of time, spreading my trusty tablecloth on the dining table, using freezer paper as a way station for the unfrosted biscotti and a finishing room for the ones I’ve already frosted. You’ll want to let the frosted cookies sit out in the air for several hours so the icing hardens up and makes it easier to transfer them to either a serving platter or a Tupperware storage container, using waxed paper to line the layers of cookies. Once frosted, these should keep for about a week if kept in an airtight container. No need to refrigerate them. One final note: if you find yourself intimidated by the amount of work these take, do what I do and make them once or twice a year only during holiday seasons. I recently made a large batch for my future daughter-in-law’s bridal shower, and shaped a few longer braids into hearts. 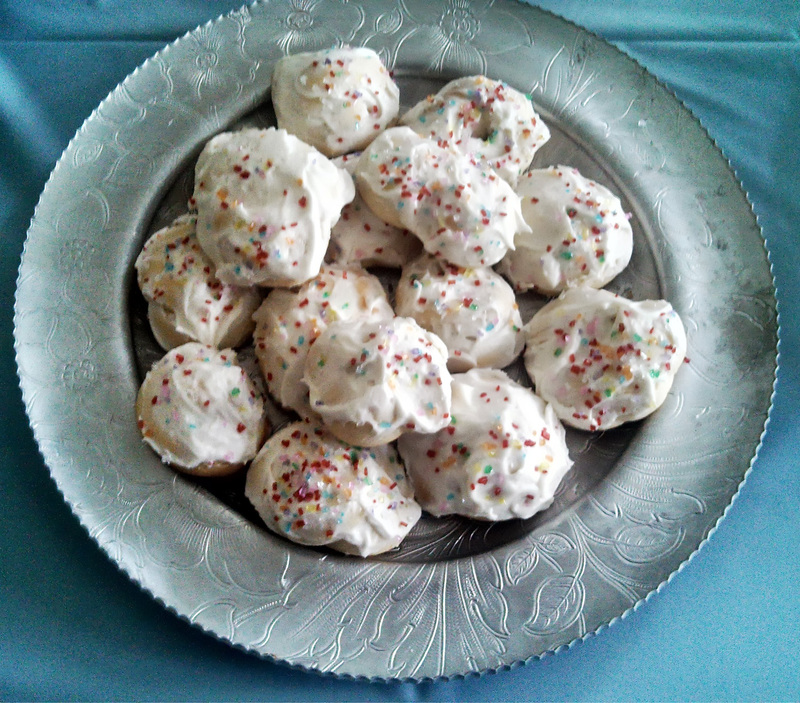 One of my favorite holiday recipes has absolutely nothing to do with dinner or dessert. I’ve had this strata recipe for years, and it comes from the kitchen of Anne Morse. My former husband and I enjoyed many gourmet dinners with Anne and her husband Andy as part of a couples’ gourmet club in the 1980s and 1990s. They hosted fabulous New Year’s Eve parties, too. The lucky ones who got to spend the night were treated to this the next morning. I don’t recall it being a cure for a hangover, but it certainly helps get one’s new year off to a good start. My tradition since marrying John is to serve this beautiful strata on Christmas morning, accompanied by crisp bacon, perhaps some fresh fruit, and steaming mugs of tea (for John) and coffee (for me). It’s a great stick-to-your-ribs breakfast on a cold morning. I use sharp cheddar rather than mild, herbs and seasonings from Penzeys, and for this particular occasion I bought good semolina bread from Whole Foods. Any white bread will do—I’ve even used baguettes—just so long as the bread is dense and has had a chance to get slightly stale. If it’s too soft you can slice it and leave it sit on the counter for a few hours. The recipe serves as many as six, but if you’re feeding a crowd you can easily double it (using two soufflé dishes, of course). Just pay careful attention to the note about doubling that follows. And take special note of the timings. Enjoy, and Happy New Year! 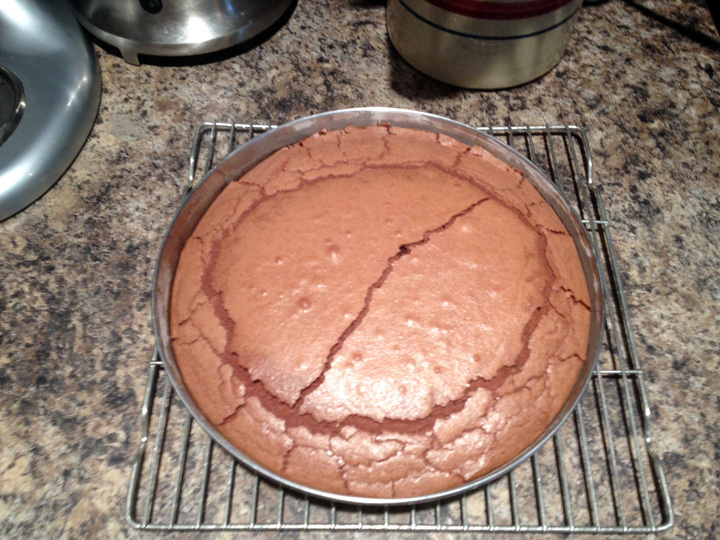 Grease a medium large casserole with high sides—I use a soufflé dish. Line the bottom with bread. Sprinkle with salt and pepper, followed by 1/3 of the onion, 1/3 of the parsley, and 1/3 of the grated cheese. Repeat this process two times. Beat eggs lightly, then add milk, Worcestershire sauce, and mustard. Pour the egg-milk mixture over the contents of the casserole. ** Cover with plastic wrap and let stand in the refrigerator for 8 hours. 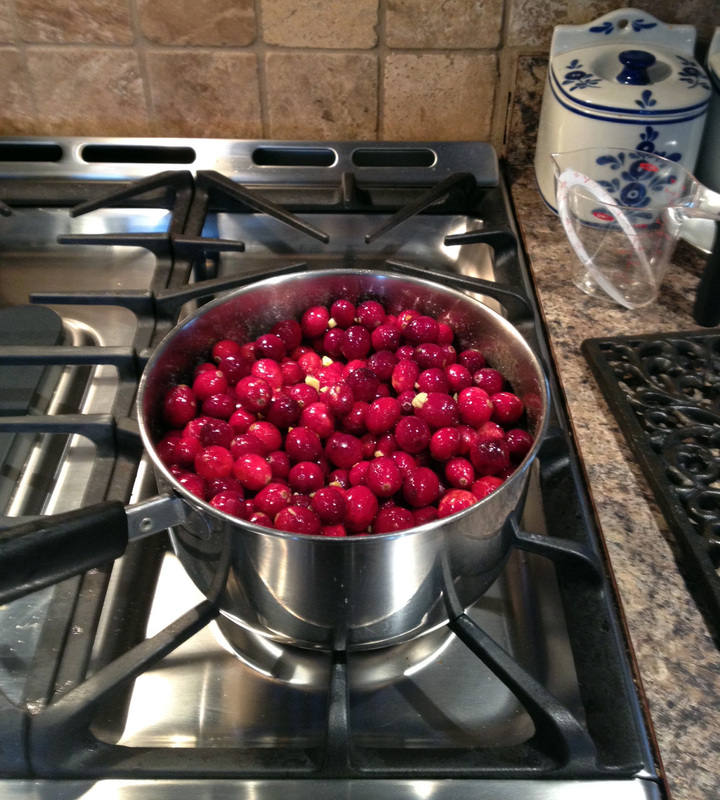 In the morning, remove from the refrigerator and let rest on the counter at room temperature for 2 hours. Bake uncovered for 50 minutes at 375-degrees. *If doubling the recipe to serve 12 instead of 6, use only five cups of milk. **I find two tricks help avoid a mess when adding the milk mixture to the strata. First, poke a few holes in the top of the strata so the milk can more easily seep down into the bottom of the dish. Second, place the dish on a baking sheet to catch any overflow. Wipe away any drips and place the entire apparatus—soufflé dish on top of the baking sheet—in the oven. 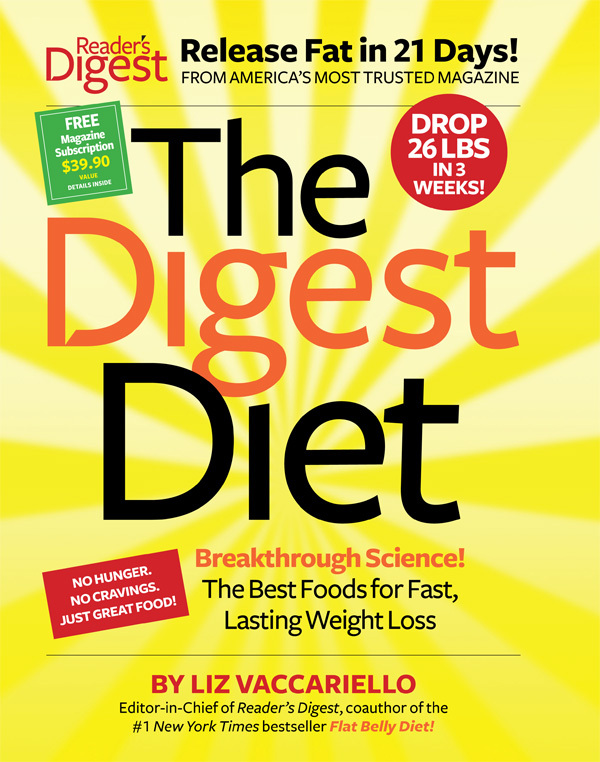 The Digest Diet: Day 18 and Wow! The Loss I’ve Seen! This is more than a diet book. It’s a food book. I know what you’re thinking. The Midlife Second Wife has really done it now. She drank the Kool-Aid. Have you not been following this? Kool-Aid is not allowed on the Digest Diet. But yes, I agree with you. Two exclamation points in one headline is a tad zealous. In my defense I could not help myself. Why? I weighed myself this morning and since starting this diet 18 days ago, I have lost nearly nine pounds. (Eight pounds six ounces, for the sticklers among you.) I am less than one pound away from my implicit goal: to get my weight under 200 pounds. Put another way, I began at 209 pounds four ounces, and I now weigh 200 pounds eight ounces. I have lost eight one-pound packages of butter, for crying out loud. Can you blame me for expressing a bit of fervor? How is this even possible? I have rarely felt hungry, I haven’t had a single craving for anything I used to consume with such abandon, and I really enjoy preparing the foods in this diet book. To call it a diet book, however, seems wrong, somehow; I think—and I hope the coming weeks will bear this out—that this is really a food book. A book on the best food to eat, how to eat it, and how often. Collateral benefits? I’ve had a few. My knee joints are not as painful as they once were. I have more energy. And my skin has much more clarity than it did two-and-a-half weeks ago. Let me tell you what I had for lunch recently. No wait. I’ll show you first. Coarsely chop two plum tomatoes, one-half of a cucumber (peeled), and one-eighth of a small red onion. Throw ’em in the blender. Add two tablespoons of flaxseed meal. Then, to your taste, add cayenne pepper and red-wine vinegar. Blend for about as long as it takes you to pour a half-glass of skim milk. And that, my friends, is that. Delicious. And as I’ve found so often with these recipes, I couldn’t finish the entire serving. 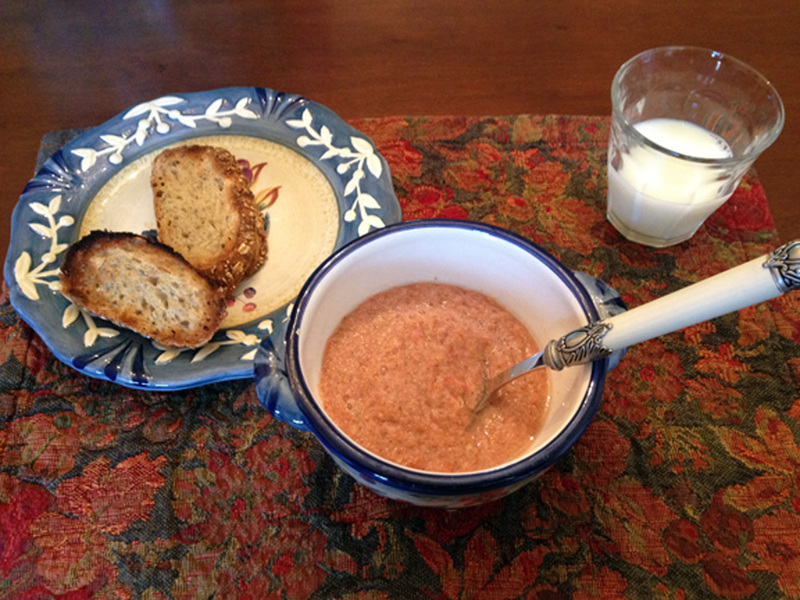 I’m going to have the one-quarter cup or so of gazpacho for lunch today with a tuna, egg, chickpea, and arugula salad (with buttermilk dressing, if you can believe it) that I made for lunch yesterday. I’d hang around and tell you more about all of this, but it’s time for my mid-morning snack. What am I having, you ask? It’s a dreamy little concoction that reminds me of a prune Danish without the pastry. I stir two chopped organic prunes into one-quarter cup of low-fat ricotta cheese and add a pinch of cinnamon to taste. (The book calls for dates but I don’t have any; I do, however, have a package of organic prunes in the fridge. It also asks for fat-free ricotta but I wasn’t able to find that.) Even using low-fat rather than fat-free ricotta, I’m on a roll. And it’s better to be on a roll than to have one around your middle. My roll, dear friends, is deflating as we speak. From the name I’ve given this recipe, you’d expect to see edible flowers or musical notes dotted throughout the bowl, wouldn’t you? 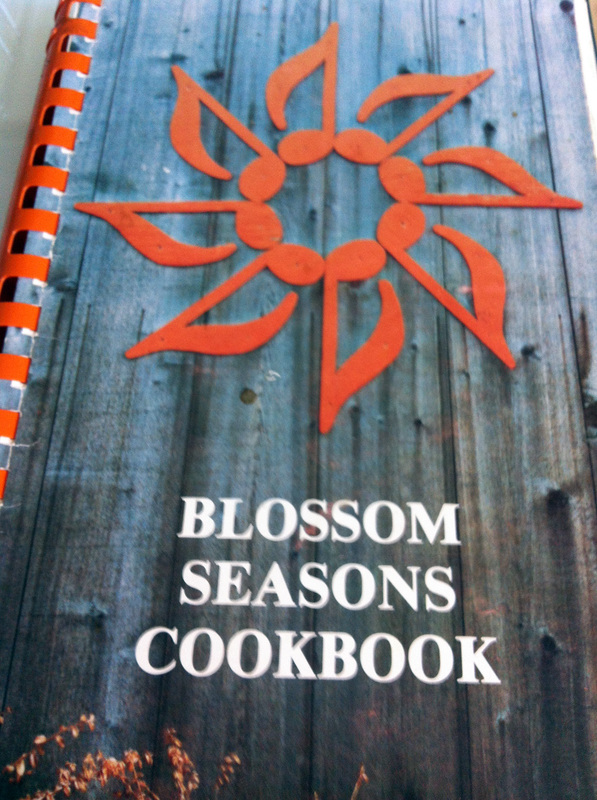 Actually, the name comes from the recipe’s original source—the Blossom Seasons Cookbook. The spiral-bound book’s title, in turn, comes from the summer home of the glorious Cleveland Orchestra. Ranked among the top ten orchestras in the world—a fact to which I can attest, having heard the orchestra many times not only at the Blossom Festival, but also at its exquisite main venue, Severance Hall, the Cleveland is a must for lovers of classical music. If you can’t get to northeast Ohio to experience their incomparable sound live (or to Miami, where, like so many snowbirds, they winter in residency), by all means get your hands on one of their many recordings. Or listen on the web via WCLV, Cleveland’s classical FM station. 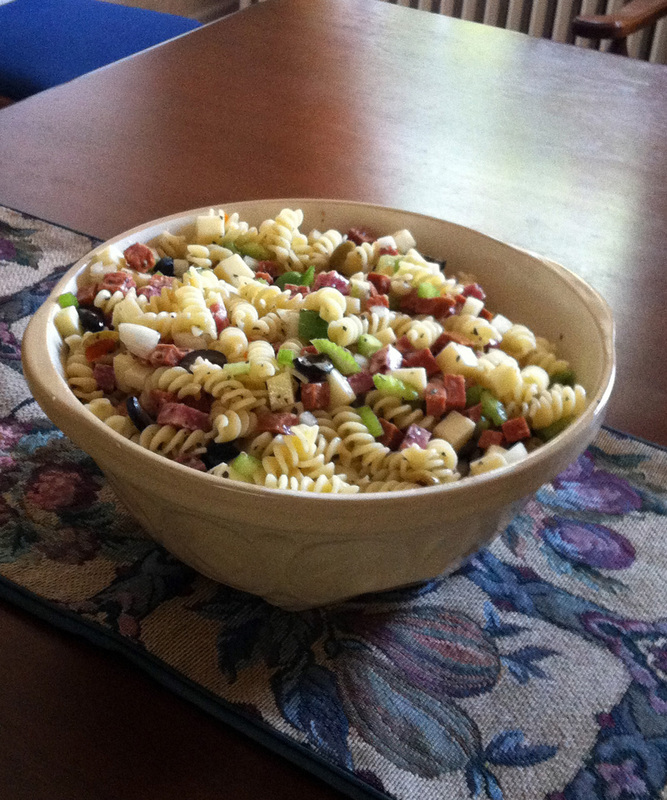 The beauty of listening at home is that you can crank up the sound while you prepare this delicious pasta salad. Cook and drain pasta. Cut cheese, salami, pepperoni, and vegetables into small pieces. Place all ingredients (except tomatoes, if you are using them) in a large bowl. 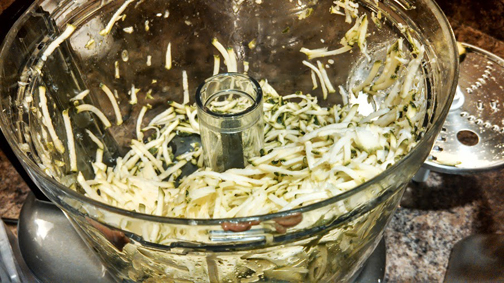 Combine oil, vinegar, and seasonings. Pour over salad and toss. Chill for 24 hours and add tomatoes (if you are using them) just before serving. Here’s an oldie but oh-so goodie—so much so that the card upon which I glued the clipping, stained to near illegibility, is dog-eared from close to 30 years of handling. If memory serves, this recipe, which I’ve adapted over time, originated in the (Cleveland) Plain Dealer, and was part of an article featuring different ways to prepare a variety of pastas. As so often happens when I discover a new recipe, I become so enamored of it that the thought of leaving it—even for a momentary dalliance with a thematic variation—never enters my mind. That’s the case with linguine alla pastora. I’m sure I’m missing out on the chance to enhance my repertoire, and I tell myself I’ll retire this from my rotation when I grow bored with it, but that hasn’t happened yet. Probably never will. What makes this recipe so attractive to me? Well, it’s a great summertime pasta dish, when farmers’ markets are brimming with the fresh vegetables it requires. Also, it’s quite easy and enjoyable to make. I love the aromas that fill the kitchen when I saute the ingredients for this meal. And, truth be told, I’m a sucker for compliments. This comes as a shock, I know. But seriously, every time I’ve served this dish, whether for family or friends, it gets raves. Positive reinforcement is a powerful thing. The only step in this recipe that might give you pause is the call for roasted red peppers. Oh sure, you can buy them in a jar at your local specialty market, but why would you when they’re so easy to prepare? I’ll explain how to roast red peppers at the end of this post. 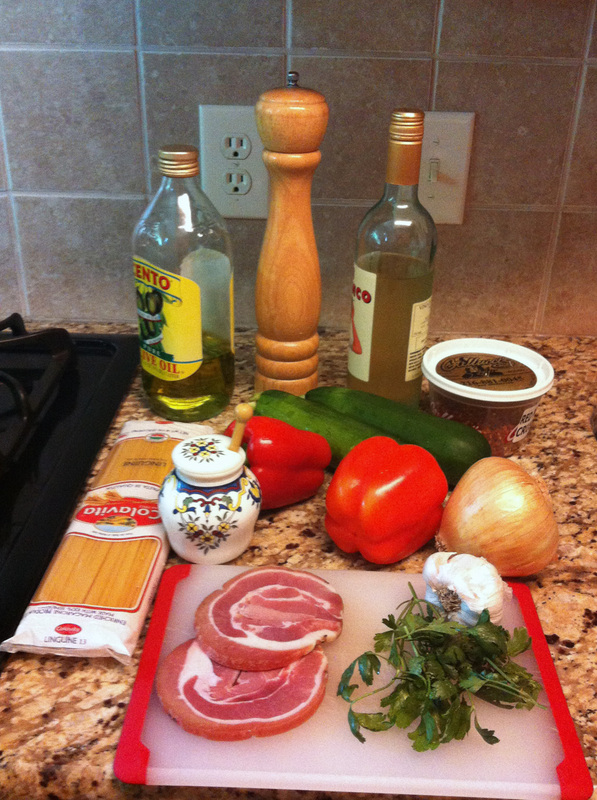 For now, join me as I walk you through one of my favorite pasta dishes, the rustic Linguine alla Pastora, or, if you will, the Shepherdess’ Linguine. You would do well to roast the red peppers first so they have a chance to cool while you’re preparing the rest of the ingredients. Instructions can be found at the end of this post. While the water is coming to the boil. heat olive oil in a 12-inch saute-pan. 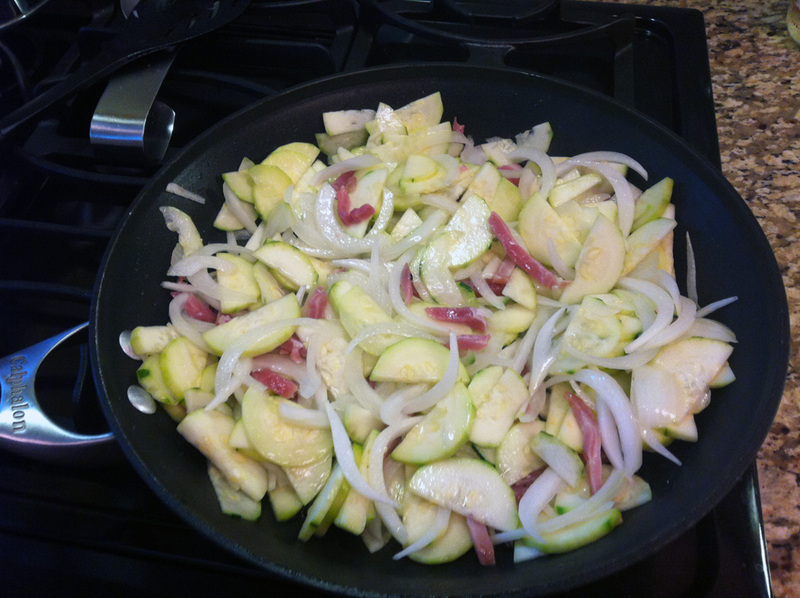 Add onion, garlic, zucchini, and pancetta, and cook at medium heat for five minutes, or until onion is transparent. Add pasta to the boiling water and cook until al dente.While the pasta is cooking, add wine to the sauteed vegetables and reduce at high heat for five minutes. Lower heat to medium, and add parsley and red pepper slices. Season with peppers and cook five minutes longer. When the pasta is cooked to your liking, drain and reserve. When the saute is ready, place about half of the cooked pasta in a large serving bowl and toss with about half of the saute. Add the remainder of the pasta and saute and toss well. 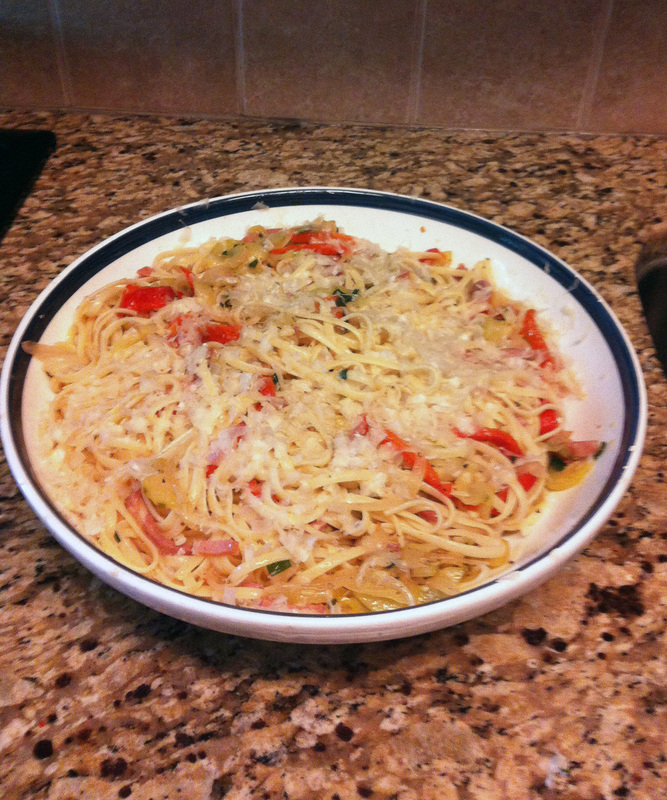 Top with grated Parmigiano-Reggiano cheese (I believe there’s no such thing as too much Parmigiano-Reggiano) and serve. *If you cannot find pancetta, you may substitute prosciutto. I’ve also made this with fresh sauteed sea scallops, omitting the Italian meat entirely. After washing the peppers, dry them and place them on a rack under the broiler element of your oven. (Don’t place them directly on the removable rack that comes with your oven; use something similar to what is shown in the photograph and place that on the removable rack. Also, I place the oven rack fairly close to the heating element.) What follows is very important and can’t be over-emphasized: keep an eye on the peppers while you are roasting them. Don’t leave the kitchen to tend to something else. You want to be nearby to (carefully) turn them with tongs as they begin to char so they are nicely roasted on all sides. The entire procedure should not take more than ten minutes, depending upon the size of the peppers and how close to the heat you’ve placed them. 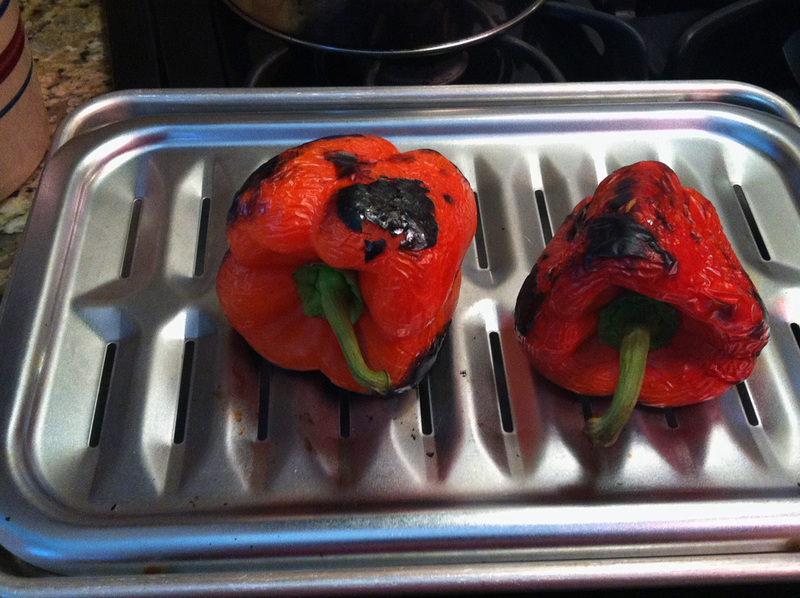 After removing the roasted peppers from the oven, very carefully wrap each one in a paper towel. They will be hot to handle, so you might want to wait a moment or two until you can comfortably perform this step. Place each wrapped pepper in a small plastic bag and set aside while you tend to other aspects of your recipe. So cossetted, they will steam nicely, making it much easier for you to remove their skins. After about 15 minutes or so, rouse the peppers from their little sleeping bags. I run them under cold water to a) make them easier to handle, since they’re still quite warm, and b) begin rubbing and pulling at the charred skin to peel it off. Using your fingers, pull the skin away from the peppers, then remove the stem and seeds. (A vegetable peeler won’t work.) After the peppers are limp, empty shells of what they used to be, slice them into strips. That’s it. You’re done! 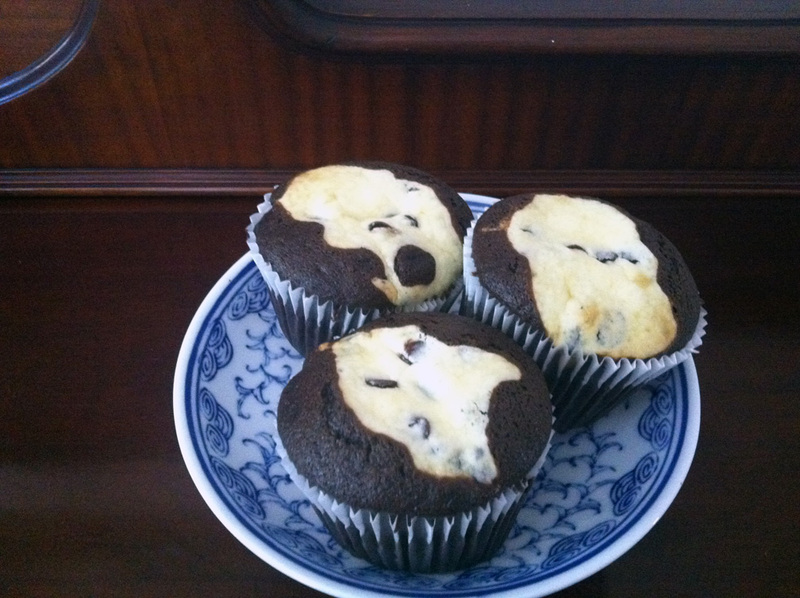 I actually remember the first time I ever made these cupcakes. It was the summer of 1976, and I was a lithe young thing who never gave a second thought to such concepts as carbohydrates, fat grams, or weight gain. Ah, the ignorance of youth! I’m guessing at the recipe’s provenance, but it could have been clipped from the (Cleveland, Ohio) Plain Dealer. A recipe prowler even at such a tender age, I was organized enough to type my finds on 5×7 index cards, but not so organized as to include their origins for future attribution. My coinage of the term “scissor-worthy” was decades away. And, since the Internet as we know it was not yet conceived, it would have come as a surprise to me that someday I would be able to share this recipe’s glories with untold readers on something called a blog. Ah, the joys of food-time travel! For some inexplicable reason, I craved these cupcakes yesterday, and so they became part of our 4th of July menu, which was shared at the home of friends. But you don’t need a national holiday to enjoy their deep, dark, chocolate-y goodness, or the richness of their moist texture. Check your pantry to make sure you have these ingredients on hand, because I promise you: you want to make these. And soon. Enjoy! Combine cream cheese, 1/3 cup sugar, egg, and 1/8 teaspoon salt in a small mixing bowl. Beat well. Add chocolate pieces and set aside. Place muffin liners in muffin pan. 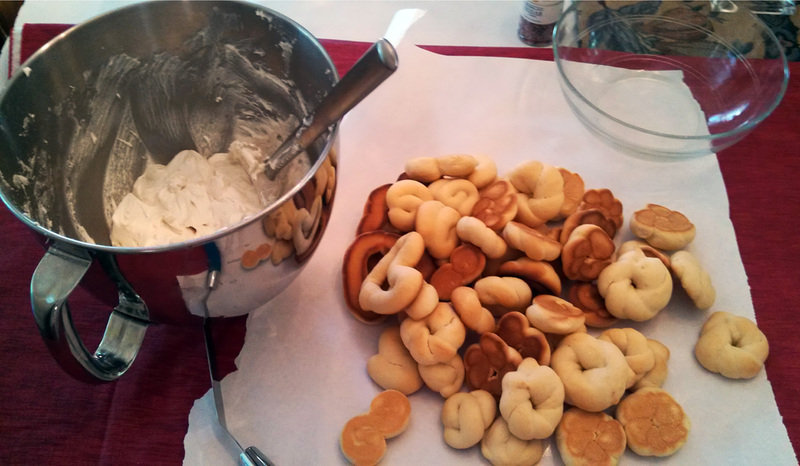 Fill each 2/3 full of batter, then drop a teaspoon of cream cheese mixture in the center. Bake at 350-degrees for 30 to 35 minutes. Cool on rack. Yields two to two and one-half dozen small cupcakes or one dozen large cupcakes. The recipe says that these freeze well when wrapped in aluminum foil, but for some reason, I’ve never had the chance to freeze them. I wonder why?